Brief history: Aaron Gertler aims to donate 10% of his pre-tax income, at a roughly annual cadence, consistent with the Giving What We Can pledge, which he took in 2014. His shared reasons for giving, as noted at https://aarongertler.net/donations/ include: "I give because I want to share the results of my luck with the less fortunate." and "I already have a good, satisfying life, so I don’t need to buy more happiness. Instead, I can use money to help a lot of other people live happier lives." Massachusetts Bail Fund 50.00 45 2018-11-28 Criminal justice reform/bail reform https://aarongertler.net/donations-all-years/ -- Gift for a friend. Percentage of total donor spend in the corresponding batch of donations: 50.00%. GiveDirectly 50.00 45 2018-11-28 Cash transfers https://aarongertler.net/donations-all-years/ -- Gift for a friend. Percentage of total donor spend in the corresponding batch of donations: 50.00%. The Life You Can Save 500.00 12 2018-11-27 Effective altruism/fundraising https://aarongertler.net/donations-all-years/ -- Timed to coincide with matching funds from Facebook's Giving Tuesday event. The match was successful, so Facebook matched the full $500. Percentage of total donor spend in the corresponding batch of donations: 12.50%. Iodine Global Network 500.00 12 2018-11-27 Global health/nutrition/iodine https://aarongertler.net/donations-all-years/ -- Timed to coincide with matching funds from Facebook's Giving Tuesday event. The match was successful, so Facebook matched the full $500. Percentage of total donor spend in the corresponding batch of donations: 12.50%. Effective Altruism Funds 1,000.00 4 2018-11-27 Effective altruism/movement growth https://aarongertler.net/donations-all-years/ -- Timed to coincide with matching funds from Facebook's Giving Tuesday event. The match was successful, so Facebook matched the full $1000. Percentage of total donor spend in the corresponding batch of donations: 25.00%. GiveWell 2,000.00 1 2018-11-27 Charity evaluator https://aarongertler.net/donations-all-years/ -- Timed to coincide with matching funds from Facebook's Giving Tuesday event. The match was successful, so Facebook matched the full $2000. Percentage of total donor spend in the corresponding batch of donations: 50.00%. Internet Archive 25.00 54 2018-11-26 Digital preservation https://aarongertler.net/donations-all-years/ -- Warm-and-fuzzy. Centre for Effective Altruism 1,000.00 4 2017-11-28 Global health/malaria https://aarongertler.net/donations-all-years/ -- 60% of donations made by Facebook on Giving Tuesday to qualify for matching by Facebook and the Bill and Melinda Gates Foundation. Percentage of total donor spend in the corresponding batch of donations: 57.14%. GiveWell 750.00 7 2017-11-28 Charity evaluator https://aarongertler.net/donations-all-years/ -- 40% of donations made by Facebook on Giving Tuesday to qualify for matching by Facebook and the Bill and Melinda Gates Foundation. Percentage of total donor spend in the corresponding batch of donations: 42.86%. Effective Altruism Funds 500.00 12 2017-10-28 Effective altruism/movement growth https://aarongertler.net/donations-all-years/ -- Money to the EA Community Fund managed by Nick Beckstead. Effective Altruism Funds 500.00 12 2017-09-27 Effective altruism/movement growth https://aarongertler.net/donations-all-years/ -- Money to the EA Community Fund managed by Nick Beckstead. GiveDirectly 250.00 27 2017-08-15 Cash transfers https://aarongertler.net/donations-all-years/ -- Money to support the basic income experiment. Donor lottery 500.00 12 2016-12-15 -- https://aarongertler.net/donations-all-years/ -- See http://effective-altruism.com/ea/14d/donor_lotteries_a_stepbystep_guide_for_mall/ for more details. Percentage of total donor spend in the corresponding batch of donations: 40.00%. Centre for Effective Altruism 750.00 7 2016-12-15 Effective altruism/movement growth https://aarongertler.net/donations-all-years/ -- End-of-year donation. $750 went to CEA, which runs a number of useful EA projects. Percentage of total donor spend in the corresponding batch of donations: 60.00%. Against Malaria Foundation,Innovations for Poverty Action,Environmental Defense Fund 350.00 25 2016-12-06 -- https://aarongertler.net/donations-all-years/ -- Share of donations from a Giving Game co-sponsored by The Life You Can Save. GiveWell 750.00 7 2016-09-10 Charity evaluator https://aarongertler.net/donations-all-years/ -- Operational funding. Against Malaria Foundation 500.00 12 2016-07-12 Global health/malaria https://aarongertler.net/donations-all-years/ -- In support of a friend’s campaign. Against Malaria Foundation 600.00 10 2016-06-26 Global health/malaria https://aarongertler.net/donations-all-years/ -- 60% of the donations that day; the other 40% went to .impact. Percentage of total donor spend in the corresponding batch of donations: 60.00%. Rethink Charity 400.00 23 2016-06-26 -- https://aarongertler.net/donations-all-years/ -- The donation was to .impact, which is now Rethink Charity. 40% of the donations that day; the other 60% went to Against Malaria Foundation. Percentage of total donor spend in the corresponding batch of donations: 40.00%. GiveDirectly 600.00 10 2016-04-17 Cash transfers https://aarongertler.net/donations-all-years/ -- The donation resulted from their basic income announcement, though I gave unrestricted funding. Percentage of total donor spend in the corresponding batch of donations: 30.00%. Against Malaria Foundation 1,400.00 3 2016-04-17 Global health/malaria https://aarongertler.net/donations-all-years/ -- 70% of the donations that day; the other 30% went to GiveDirectly. Percentage of total donor spend in the corresponding batch of donations: 70.00%. GiveWell 900.00 6 2016-02-01 -- https://aarongertler.net/donations-all-years/ -- Operational funding. 90% of the donations that day, the other 10% went to CFAR. Percentage of total donor spend in the corresponding batch of donations: 90.00%. Center for Applied Rationality 100.00 36 2016-02-01 Rationality improvement https://aarongertler.net/donations-all-years/ -- 10% of the donations that day, the other 90% went to GiveWell. Percentage of total donor spend in the corresponding batch of donations: 10.00%. Rethink Charity 500.00 12 2016-01-15 -- https://aarongertler.net/donations-all-years/ -- The donation was to .impact, which is now Rethink Charity. 40% of donations made that day. Percentage of total donor spend in the corresponding batch of donations: 40.00%. Parsemus Foundation 250.00 27 2016-01-15 -- https://aarongertler.net/donations-all-years/ -- Gift to David Benatar. 20% of donations made that day. Percentage of total donor spend in the corresponding batch of donations: 20.00%. Against Malaria Foundation 500.00 12 2016-01-15 Global health/malaria https://aarongertler.net/donations-all-years/ -- Matched a fundraiser from EA Adelaide. 40% of donations made that day. Percentage of total donor spend in the corresponding batch of donations: 40.00%. 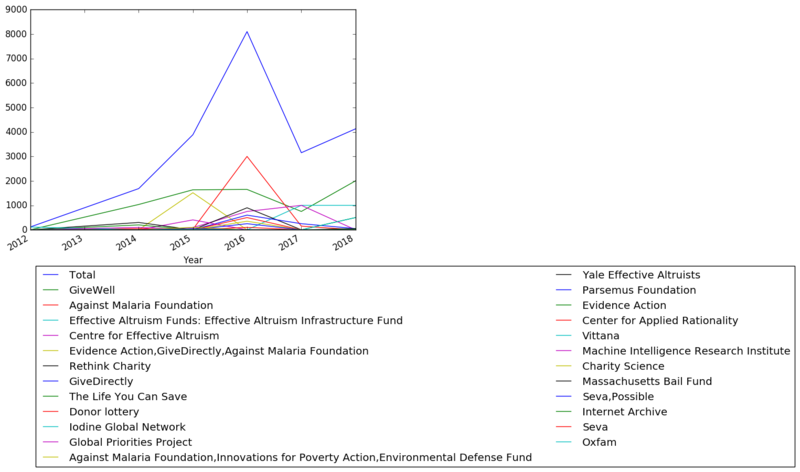 Evidence Action,GiveDirectly,Against Malaria Foundation 1,515.00 2 2015-11-23 -- https://aarongertler.net/donations-all-years/ -- Two-thirds of this was matching funds for winter fundraisers by student EA groups. The other third went to sponsor a Giving Game. GiveWell 495.00 21 2015-10-16 Charity evaluator https://aarongertler.net/donations-all-years/ -- Monthly donation. 55% of total monthly donation. Percentage of total donor spend in the corresponding batch of donations: 55.00%. Global Priorities Project 405.00 22 2015-10-16 Charity evaluator https://aarongertler.net/donations-all-years/ -- Monthly donation. 45% of total monthly donation. Percentage of total donor spend in the corresponding batch of donations: 45.00%. GiveWell 500.00 12 2015-09-17 Charity evaluator https://aarongertler.net/donations-all-years/ -- Monthly donation. Support for GiveWell operations. Percentage of total donor spend in the corresponding batch of donations: 100.00%. GiveWell 400.00 23 2015-08-09 Charity evaluator https://aarongertler.net/donations-all-years/ -- Monthly donation. Percentage of total donor spend in the corresponding batch of donations: 100.00%. GiveWell 100.00 36 2015-07-25 Charity evaluator https://aarongertler.net/donations-all-years/ -- Monthly donation. Percentage of total donor spend in the corresponding batch of donations: 100.00%. Internet Archive 20.00 55 2015-07-25 Digital preservation https://aarongertler.net/donations-all-years/ -- Warm-and-fuzzy. 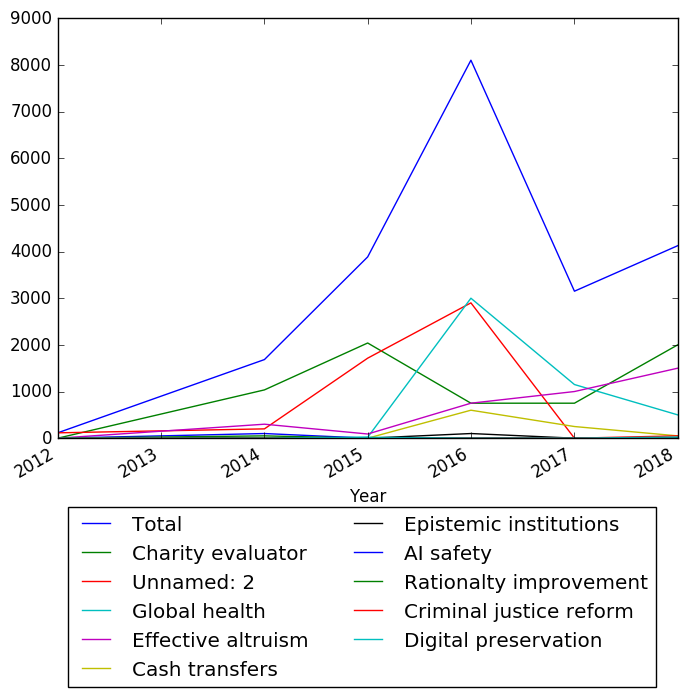 Centre for Effective Altruism 75.00 44 2015-06-11 Effective altruism/movement growth https://aarongertler.net/donations-all-years/ -- Donation to Giving What We Can, which is now under the Centre for Effective Altruism. GiveWell 50.00 45 2015-05-23 Charity evaluator https://aarongertler.net/donations-all-years/ -- Monthly donation. Percentage of total donor spend in the corresponding batch of donations: 100.00%. Against Malaria Foundation 20.00 55 2015-05-04 Global health/malaria https://aarongertler.net/donations-all-years/ -- Gift for a friend birthday. Seva 30.00 53 2015-03-12 -- https://aarongertler.net/donations-all-years/ -- Yale Effective Altruists giving game. Oxfam 20.00 55 2015-03-12 -- https://aarongertler.net/donations-all-years/ -- Yale Effective Altruists giving game. Charity Science 100.00 36 2015-02-20 -- https://aarongertler.net/donations-all-years/ -- Annual matching fundraiser. GiveWell 40.00 51 2015-01-31 Charity evaluator https://aarongertler.net/donations-all-years/ -- In memory of a friend. GiveWell 50.00 45 2015-01-27 Charity evaluator https://aarongertler.net/donations-all-years/ -- In memory of a friend. 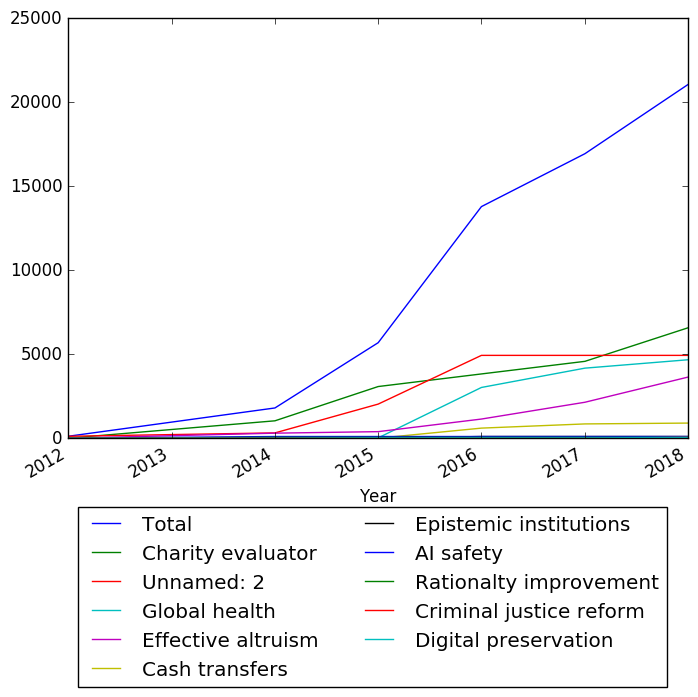 Centre for Effective Altruism 15.00 59 2015-01-21 Effective altruism/movement growth https://aarongertler.net/donations-all-years/ -- Annual matching fundraiser. Center for Applied Rationality 50.00 45 2014-12-27 Rationalty improvement https://aarongertler.net/donations-all-years/ -- Annual matching fundraiser. Evidence Action 100.00 36 2014-12-25 -- https://aarongertler.net/donations-all-years/ -- Yale Effective Altruists winter fundraiser. Evidence Action 100.00 36 2014-12-23 -- https://aarongertler.net/donations-all-years/ -- Yale Effective Altruists winter fundraiser. GiveWell 100.00 36 2014-12-02 Charity evaluator https://aarongertler.net/donations-all-years/ -- Monthly donation. Percentage of total donor spend in the corresponding batch of donations: 100.00%. GiveWell 100.00 36 2014-11-02 Charity evaluator https://aarongertler.net/donations-all-years/ -- Monthly donation. Percentage of total donor spend in the corresponding batch of donations: 100.00%. Yale Effective Altruists 300.00 26 2014-10-22 Effective altruism/movement growth https://aarongertler.net/donations-all-years/ -- Initial funds for a nonprofit founded by him. Spent on operating costs and advocacy work. GiveWell 125.00 34 2014-09-30 Charity evaluator https://aarongertler.net/donations-all-years/ -- Monthly donation. Percentage of total donor spend in the corresponding batch of donations: 100.00%. GiveWell 38.00 52 2014-09-07 Charity evaluator https://aarongertler.net/donations-all-years/ -- Monthly donation. Percentage of total donor spend in the corresponding batch of donations: 100.00%. Machine Intelligence Research Institute 100.00 36 2014-08-01 AI safety https://aarongertler.net/donations-all-years/ -- Monthly donation. GiveWell 152.00 30 2014-07-23 Charity evaluator https://aarongertler.net/donations-all-years/ -- Monthly donation. Percentage of total donor spend in the corresponding batch of donations: 100.00%. GiveWell 150.00 31 2014-07-03 Charity evaluator https://aarongertler.net/donations-all-years/ -- Monthly donation. Percentage of total donor spend in the corresponding batch of donations: 100.00%. GiveWell 20.00 55 2014-06-05 Charity evaluator https://aarongertler.net/donations-all-years/ -- Gift for a friend. GiveWell 200.00 29 2014-05-29 Charity evaluator https://aarongertler.net/donations-all-years/ -- Birthday donation. GiveWell 150.00 31 2014-03-07 Charity evaluator https://aarongertler.net/donations-all-years/ -- First donation after becoming an effective altruist. Vittana 115.00 35 2012-12-24 -- https://aarongertler.net/donations-all-years/ -- Christmas gifts for family.